The 'trigger cord' activates and deactivates your light bank. It uses a standard 120 Volt circuit to open and close the high power relay inside the Helios 5 lighting controller. When the trigger cord activates the relay, you will hear a 'thunk' sound. This is the relay turning ON your light bank. When the trigger cord defeats the 120 Volt power to the relay, you will hear the 'thunk' sound again and your lights will be OFF. To operate your light bank, plug the 'trigger cord' into a 120 Volt 24 hour appliance timer (we suggest Apollo 6 or Apollo 7 120V timers) and set your required lighting schedule (normally 18 hours in vegatative stage and 12 hours in flowering stage). Your grow lights will operate based on the ON/OFF settings on the 24 hour timer. See application diagram for more information. 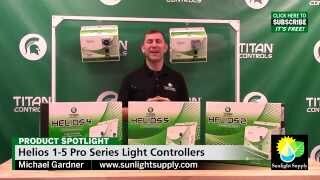 The 24 hour timer CANNOT be plugged into 120 Volt outlet on the front of the Helios 5 lighting controller. It must be plugged into a separate 120 Volt outlet to function correctly.